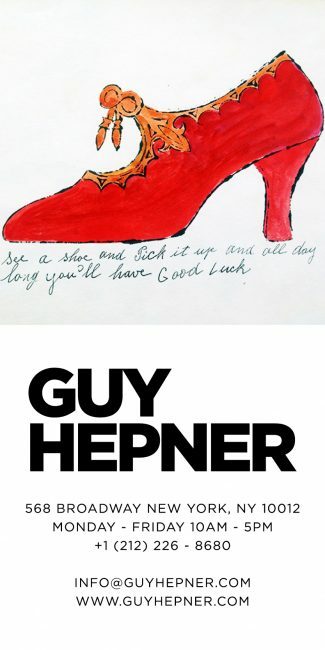 Guy Hepner Art Gallery is proud to present the Ads Portfolio by leading Pop artist, Andy Warhol. 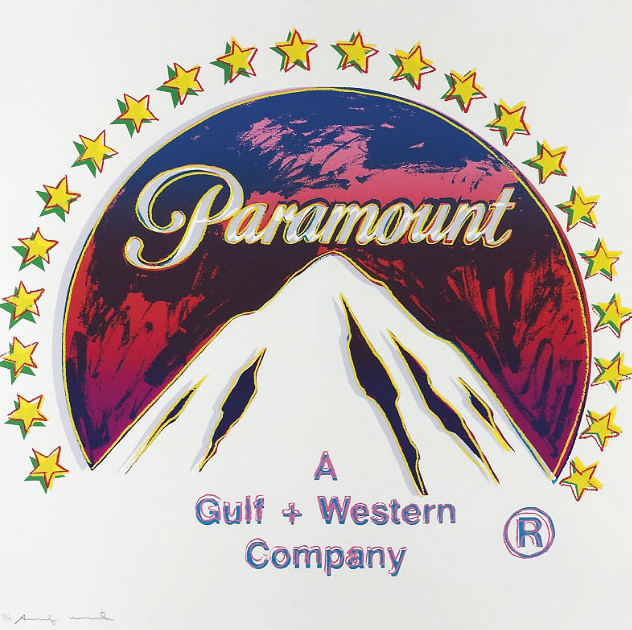 This series is one of his most sought after sets of prints since it debuted in 1985, making it one of the last portfolios Warhol released before his untimely death in 1987. The series portrays the defining features of 1980s iconic advertisements and elevated the product being marketed to a status of art. The Ads portfolio is made up of ten screen prints on Lenox Museum Board by Andy Warhol and are an edition of 190. It is perhaps now one of the most ubiquitous signifiers of cool, progressive technology today. No surprises then that Andy Warhol should have been one of the first artists to appropriate the iconic bitten-into apple at its early inception. The print is part of his ‘Ad series’ from the 1980s and signals his return to his earlier work of the 1960s. 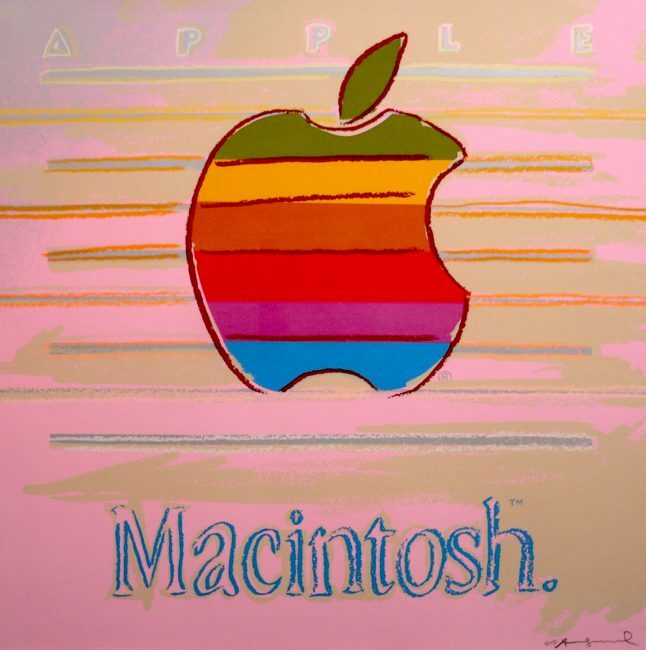 Like much of his work, ‘Apple/Macintosh’ does not simply reproduce the image, but subtly undercuts its iconic status by investing it with a patina of the slightly outmoded and deliberately representing it with crude techniques. Andy Warhol’s beginnings as a product marketer heavily influenced his artistic career, in which he glamorized and transformed everyday objects, like soup cans and cleaning supplies, into works of art. So in the 1980’s when Feldman Fine Arts commissioned Warhol to create his “ADS” series, Warhol was in his element. The portfolio consists of Mobil, Blackglama (Judy Garland), Paramount, Life Savers, Chanel, Rebel Without a Cause (James Dean), Van Heusen (Ronald Reagan), The New Spirit (Donald Duck), Volkswagen, and Apple. These images that make up Warhol’s ADS Series reflect Warhol’s fascination with American advertising, consumerism and commercialism, three major themes of his life’s work. 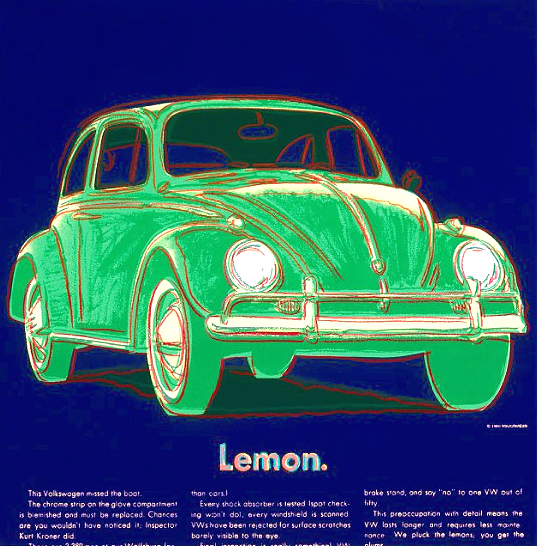 Like the Volkswagen company advertising its automobiles, Warhol’s Ad series serves as a form of advertisement for Warhol’s artwork, blatantly acknowledging the commercial nature of American society and urging consumers to continue buying iconic imagery that will forever proposition them with a new and exciting product. More than any other artist of his generation, Andy Warhol understood how the reproduced image had come to reflect and shape contemporary life. When viewed collectively, the series portrays the defining features of 1980s American culture, confident and consumer driven. Guy Hepner Contemporary Art Gallery in New York City is pleased to present Andy Warhol Artwork, prints, canvasses, portfolio, ads, images, screen prints for sale. Inquire about prices to buy Andy Warhol art.